This space wallpaper from ESO's Very Large Telescope (VLT) shows the newly discovered planet HD95086 b, next to its parent star. This space wallpaper from ESO's Very Large Telescope (VLT) shows the newly discovered planet HD95086 b, next to its parent star. 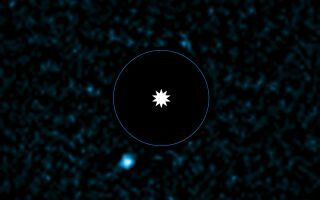 The star itself has been removed from the picture during processing to enhance the view of the faint exoplanet and its position is marked. The exoplanet appears at the lower left. The blue circle is the size of the orbit of Neptune in the Solar System. This image was released June 3, 2013.